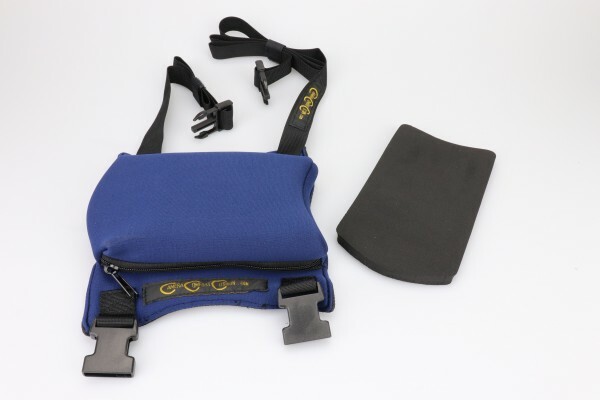 Product information "C3 Camera Comfort Cushion - black/blue"
The Camera Comfort Cushion is a shoulder pad designed for camera operators to help prevent shoulder pain and discomfort associated with continuous shooting. Our cushion is designed to give maximum flexibility suited to the camera operator and his or her equipment. The cushion works with a variety of camera sizes from shoulder mounted MiniDV cameras, to broadcast sized cameras and motion picture film cameras. The Camera Comfort Cushion is 7 1/2 '' long by 7 1/2” wide. The pad pocket is 7 1/2” long by 4 1/2” wide. There is a 7'' zipper attached to the front to easily insert the foam pads. The Camera Comfort Cushion is made with a 2mm Neoprene top. The bottom is made with a non slip neoprene mesh, which clings to the shoulder, allowing minimal movement of the comfort cushion. Related links to "C3 Camera Comfort Cushion - black/blue"
Customer evaluation for "C3 Camera Comfort Cushion - black/blue"